A young college student had stayed up all night studying for his zoology test the next day. As he entered the classroom, he saw ten stands with ten birds on them with a sack over each bird and only the legs showing. He sat right on the front row because he wanted to do the best job possible. The professor announced that the test would be to look at each set of bird legs and give the common name, habitat, genus, species, etc. The student looked at each set of bird legs. They all looked the same to him. He had stayed up all night studying, and now had to identify birds by their legs. The more he thought about it, the madder he got. 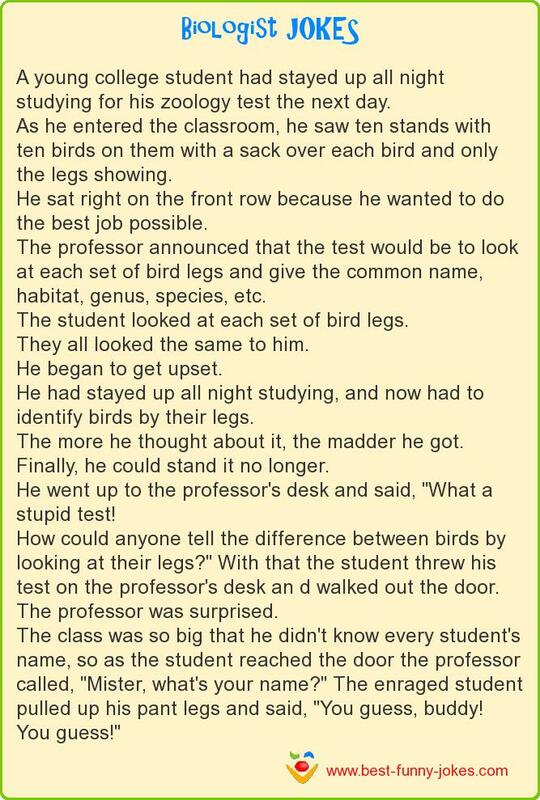 He went up to the professor's desk and said, "What a stupid test! How could anyone tell the difference between birds by looking at their legs?" With that the student threw his test on the professor's desk an d walked out the door. The class was so big that he didn't know every student's name, so as the student reached the door the professor called, "Mister, what's your name?" The enraged student pulled up his pant legs and said, "You guess, buddy!